It's Official - Postpone to 4th October 2009 - 2 weeks after raya. How am I going to participate??? Have to reapply visa lagi.....susah susah kan jadi athlete PRO ani. To be an Ironman is much more difficult than to be a triathlete. Your safety and welfare is our utmost priority. It is with deep regret that the management of Ironman 70.3 Putrajaya hasmade the decision to postpone Ironman 70.3, which was originally scheduledfor 26th July 2009. Due to the recent outbreak of the H1N1 epidemic both internationally andlocally Ironman 70.3 Putrajaya 2009 is hereby postponed to 4th October 2009.This action is being taken to comply with the requirements from the localand national government authorities in order to safeguard and control thenumber of imported cases which have been on the rise in recent times. All registered participants will have their entries brought forward to thenew date.For those athletes who are unable to compete on the new date, a refundpolicy is in progress and will be released in the coming days. Please staytuned for additional refund and race information via email. We apologize for any inconvenience caused due to this postponement and willkeep you updated on the development of this situation as more information ismade available to us. We are committed to keep the safety and welfare of allparticipants as our utmost priority. 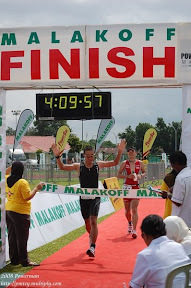 I am very disappointed with the way the Putrajaya Ironman 70.3 has been organized. The race official website is somewhat useless as there is no information available for the race week. No race courses are available, the venues for correcting the race kit and race briefting are not available. Can't believe this is the same race organizer who organize the Ironman Langawi!